If the conference is using Ex Ordo for registration purposes, you can register yourself, or a colleague or friend. 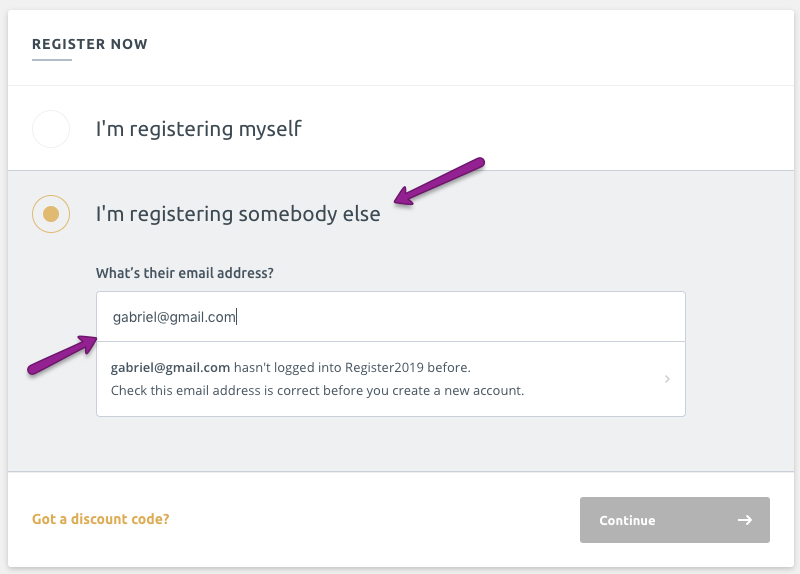 You'll need details such as the delegate's name and email address, and it will mean they are registered and accounted for, but don't need to login themselves to register. If registration is open, when you login you will see a My Registration card. Click Register. First, select to register for someone else and then enter their email address. If they've already registered or in the middle of registering themselves, you won't be able to register them. Click Continue to move forward. Now, complete each step of the registration form, filling in the registration details for this delegate. Read our article on this here. When you complete the registration, both you and the registered delegate will receive an email of confirmation. To view or change any of the registration details, enter your Registration hub. There you'll see anyone you've registered for, including if you've registered for yourself. You can create new registrations - for more delegates or yourself - with the Register Now button.